Woodpecker Kitchen Designs Inc. provides an integrated one-stop shopping experience for your custom kitchen needs. Featuring high end cabinets from top brand name manufactures, we can provide a comprehensive list of consultation, design, project management and installation services. Our goal is to make your renovation experience gratifying and enjoyable. Our designers will walk you through the many choices that are available to you for cabinetry, countertops, backsplashes, flooring, lighting and more. We believe in offering the best quality of kitchen design products and materials and carry a large selection in a variety of different styles to ensure we have something for everyone, whether you like modern and clean to cottage cute or a chef’s dream kitchen. We offer a large selection of quality Canadian manufactured cabinetry that is available in a variety of colours, styles, depths and heights to ensure a fit for all your needs even in small kitchens. A visit to our Toronto showroom will allow you to touch feel and see all the materials we have to offer for your custom kitchen. 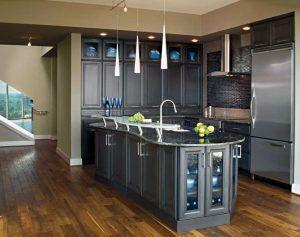 Our experienced kitchen designers will work with you on your desired layout and functions. They will accommodate your needs into the design such as the desire for an island with a sink, more pantry space, display areas, work desk areas, breakfast bars, deeper cabinets for kitchen equipment and anything else you desire in your kitchen. Not sure what you want in your Toronto kitchen? Then our designers can walk you through a multitude of options including style, layout and cabinetry options. We pride ourselves in performing quality work with top Canadian brand names you can trust. Our tradespeople are all highly skilled and experienced and as a whole our company has over 18 years’ experience designing kitchens of all sizes and for all budgets for all types of homes, townhouses and condos in Toronto. But we don’t expect you to take our word for it. Feel free to browse some of our projects below with before, during and after photos as well as browse our Testimonials from some of our incredibly happy clients here in Toronto and the Greater Toronto area.